Regular veterinary dental check-ups and cleanings are just as important for your pet as they are for you! No worries though – we’re here with all the preventive oral health care supplies your pet needs and we have all the latest veterinary dental equipment and training to keep your pet’s mouth and gums in great shape. Clean healthy teeth and gums are critical to your pet’s overall health. 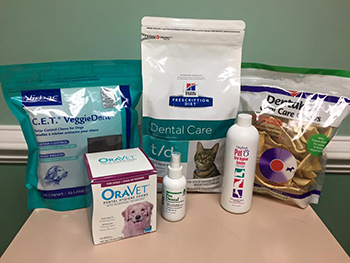 Our veterinary staff at Old Dominion Animal Hospital wants you to know that if left untreated, your pet’s dental problems can lead to more serious health problems as oral bacteria enters the bloodstream and travels to major organs. 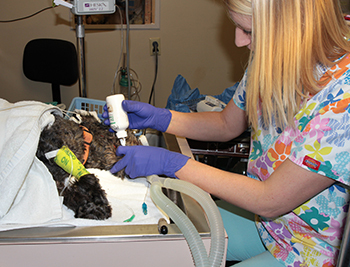 The organs most commonly affected are the lungs, heart, kidneys, and liver, and when these organs are infected it can threaten your pet’s health. Regular oral exams, cleanings, and periodontal care should be part of your pet’s health plan. Old Dominion Animal Hospital in Charlottesville is equipped with modern, high-speed veterinary dental machines and our staff is highly trained to meet your pet’s dental needs. We use digital dental radiography which gives us extremely clear dental images to better diagnose your pet’s dental health. These digital x-rays also allow us to easily show you images of your pet’s teeth. Be sure to talk to us about your pet’s dental exam.